These round vents are easy to install. They fit into the hole made by a drill type hole saw and are held in place by tabs on the side. 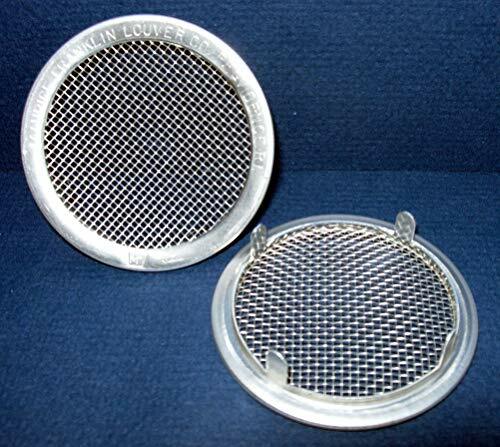 They are used for ventilating soffits and eaves, insect cages, display cases and spice racks. Note: These are made for thin material like metal, plastic, or glass. They do not work well in wood. The tabs need to be bent over from the rear. Package of 6 vents. These round plastic are easy to install. They fit into the hole made by a drill type hole saw and are held in place by knobs on the side. They are used for ventilating soffits and eaves, insect cages, display cases and spice racks. Package of 6 vents. These round vents are easy to install. They fit into the hole made by a drill type hole saw and are held in place by knobs on the side. They are used for ventilating soffits and eaves, insect cages, display cases and spice racks. Package of 4 vents. 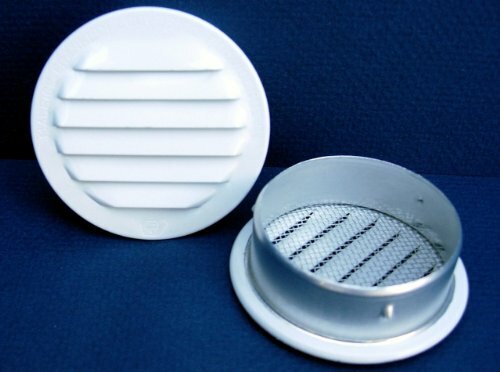 These small round vents are made of high quality .020 gauge aluminum. They have insect screens and are easy to install. They fit into the hole made by a drill-type hole saw and are held in place by knobs on the side of the vent. No nails or screws are needed. They are used for a wide variety of ventilation, from eave and soffit ventilation to insect cages, display cases, spice racks, electrical and mechanical boxes, cargo crates, etc. These vents are designed for use in wood and do not work well in metal. These round vents are easy to install. They fit into the hole made by a drill type hole saw and are held in place by tabs on the side. They are used for ventilating soffits and eaves, insect cages, display cases and spice racks. Note: These are made for thin materials like metal, plastic or glass. They do not work well in wood. The tabs need to be bent over from the back. Package of 4 vents. These round vents are easy to install. They fit into the hole made by a drill type hole saw and are held in place by knobs on the side. They are used for ventilating soffits and eaves, insect cages, display cases and spice racks. Package of 6 vents. These small round vents are easy to install. They fit into the hole made by a drill type hole saw and are held in place by knobs on the side. 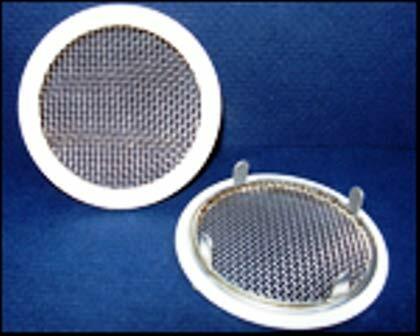 They are used for ventilating soffits, display cases, insect and lizard cages. Package of 4 vents. 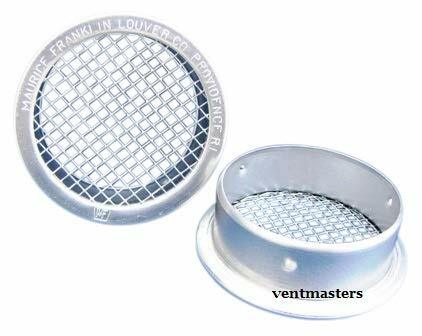 These small round vents are made of high quality .020 gauge aluminum. 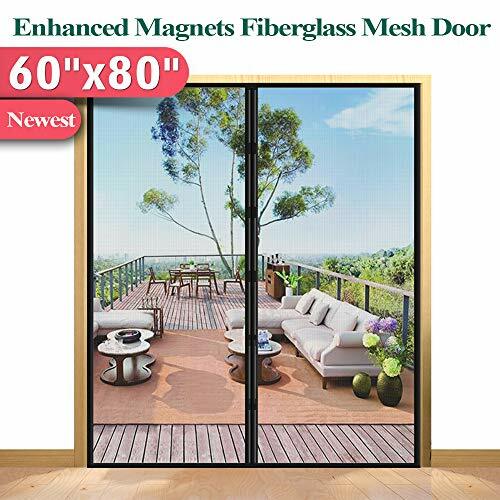 They have insect screens and are easy to install. They fit into the hole made by a drill-type hole saw and are held in place by knobs on the side of the vent. No nails or screws are needed. They are used for a wide variety of ventilation, from eave and soffit ventilation to insect cages, display cases, spice racks, electrical and mechanical boxes, cargo crates, etc. These vents are designed for use in wood and do not work well in metal. Available in sizes from 1 inch to 6 inches. Colors available are Black, Brown, Mill, and White. These round vents are easy to install. They fit into the hole made by a drill type hole saw and are held in place by tabs on the side. 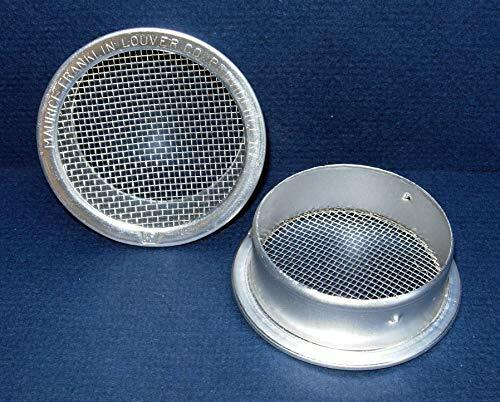 They are used for ventilating soffits and eaves, insect cages, display cases and spice racks. Note: These are made for thin material like metal, plastic, or glass. They do not work well in wood. The tabs need to be bent over from the rear. Package of 4 vents. 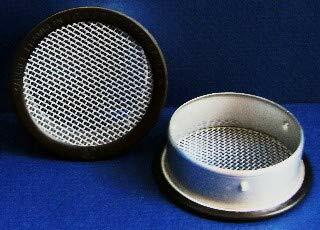 These small round vents are made of high quality .020 gauge aluminum. They have insect screens and are easy to install. They fit into the hole made by a drill-type hole saw and are held in place by knobs on the side of the vent. No nails or screws are needed. They are used for a wide variety of ventilation, from eave and soffit ventilation to insect cages, display cases, spice racks, electrical and mechanical boxes, cargo crates, etc. These vents are designed for use in wood and do not work well in metal. Available in sizes from 1 inch to 6 inches. Colors available are Black, Brown, Mill, and White. Package of 6. 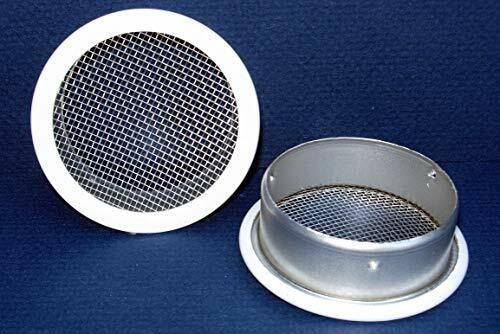 6 Pack, 1" White Aluminum Round Insect Proof Mini Louvers With Screen, Overall Size 1.219", Fits 1" Hole Diameter, 0.185 SQIN Free Area.